The third edition of James' innovative text continues to demonstrate business law principles in a clear and accessible style. The objective of a business law subject is to ensure that students acquire sufficient knowledge of the law of business so they can recognise and solve simple legal problems, organise their affairs in order to avoid more complex or serious legal problems and appreciate the connection of legal principles within a range of commercial environments. 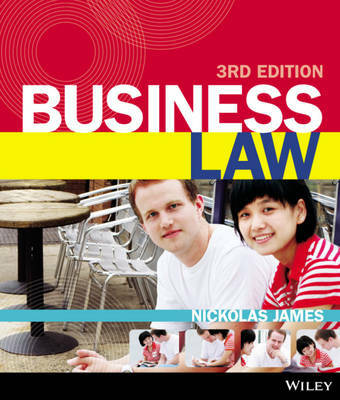 Because the majority of students are required to study business law as part of either a commerce or business degree, this textbook follows a functional approach to the study of business law rather than doctrinal so the principles of business law are contextualised within a business environment. Business students need to know more than what the law is, they need to know where to find it, how to read it, how to use it and how it impacts on all facets of business. Students who use this textbook will develop a greater awareness of the law and its broad application to business and commercial environments. The third edition of James' innovative text continues to demonstrate business law principles in a clear and accessible style. The objective of a business law subject is to ensure that students acquire sufficient knowledge of the law of business so they can recognise and solve simple legal problems, organise their affairs in order to avoid more complex or serious legal problems and appreciate the connection of legal principles within a range of commercial environments. Because the majority of students are required to study business law as part of either a commerce or business degree, this textbook follows a functional approach to the study of business law rather than doctrinal so the principles of business law are contextualised within a business environment. Business students need to know more than what the law is, they need to know where to find it, how to read it, how to use it and how it impacts on all facets of business. Students who use this textbook will develop a greater awareness of the law and its broad application to business and commercial environments.